They say an army marches on its stomach, and it’s a bit like that at Minsteracres. Pretty much everyone who comes to the house will have contact with the kitchen, be it for coffee and homemade biscuits, hearty meals with tasty puddings, or the occasional celebratory meal. 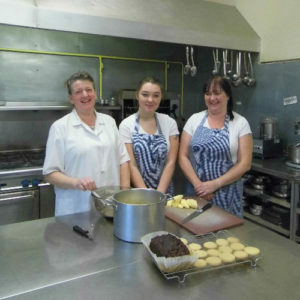 So it’s no surprise that one of the best known people in Minsteracres hails from the kitchen. Margaret O’Brien has just celebrated 20 years, starting as a part time cook when her youngest child was just six months old and is still here today as our catering manager of some 13 years’ standing. Actually, Margaret’s association with Minsteracres began long before then. We have photographic evidence of her visit on retreat as a sixth-former from St Bede’s in Lanchester, when, incidentally, she saw the murals in the retreat house being painted. Later her father, Andrew O’Connor, became the first deacon in the north east under the tutelage of Fathers Mark and Luke. Andrew also ran a Manpower Services Commission training scheme at Minsteracres after the closure of the steelworks in Consett in the 1980s, providing people with skills to find new work in an area stripped of opportunity. 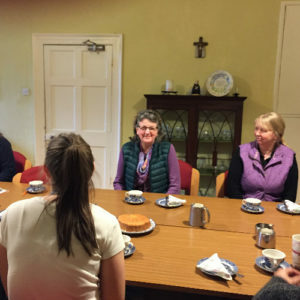 Like so many who find their way into Minsteracres, it all began with an innocent conversation with Sr Dympna Smith, who for around twenty years helped run the retreat centre. “I happened to mention to Sr Dympna that I’d be happy to help out if they needed it. The next thing I know I’m working up here as an evening and weekend cook, gradually increasing my days as others left!” says Margaret. Margaret has seen big changes in that time. “To begin with it was all big parish retreats. We would cook pork and carrots on Saturday and roast beef with Yorkshire pudding on a Sunday. The service was done by the community at Minsteracres, and the retreatants helped with the washing up. As the sixth of 10 children, Margaret is both resourceful and pragmatic. There isn’t much that fazes her and she insists that it’s the whole team that makes the kitchen so successful. You might think that with such a demanding, physical job she would want to put her feet up when she gets home. Not a bit of it! She began clog dancing 35 years ago to be able to spend more time with her husband Aubrey, a rapper sword dancer, then transferred to Morris dancing in Hexham because they practiced on a Monday, rather than a Friday which clashed with her work shifts. Dancing has taken them all over Europe and as far afield as the States.